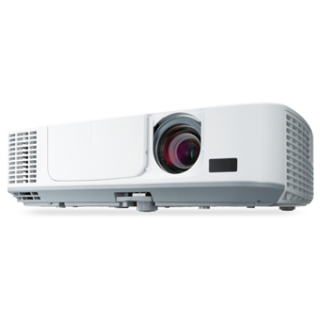 NEC Display Solutions of America has made available its M271X, M311X, and M311W projectors, mainstream models ideal for education and small-to-medium-sized business environments that need essential features, including bright images, automated technologies and eco-friendly appeal. The M271X, M311X and M311W will be available in December 2012 at an estimated street price of $802, $912, and $989, respectively. The environment is kept in mind with these models through ECO Mode technology, a carbon savings meter, extended filter life, and energy-saving features such as quick startup and direct power off. The M271X and M311X projectors offer lamp life up to 10,000 hours and a high contrast ratio of 3000:1. The M311W projector offers up to 8,000 hours of lamp life and the same contrast ratio. The projectors consume 12 percent less power in ECO Mode than earlier models. NEC’s M Series is easy-to-use and budget-friendly, providing portability and brightness up to 3100 lumens. A new feature offered is the Wireless Imaging Utility (WIU), which enables users to send images from their iPad directly to the projector. Crestron Roomview Connect provides unified management by controlling multiple projectors connected to a network while providing emergency messaging capabilities desired in today’s classrooms.